Last night we stopped by family who live in Jerusalem’s Moslem Quarter, as we often do for Havdala– the weekly ceremony that separates Shabbat from the rest of the week– that marks the end of Shabbat. We customarily enter via Damascus Gate, which, dark, forbidding, and dirty, is mostly thronged with locals selling fruit, greens, as well as discs, knock-off shoes, cell phones, and the like. Last night was different. At the Damascus Gate, the amazing collage of scenes ranging from arabesques, stones rising, stones falling, even flames superimposed on its imposing walls. The crowds– Arabs, Jews, Christians alike–seated along the amphitheater-like entrance to the Gate were entranced. So were we. 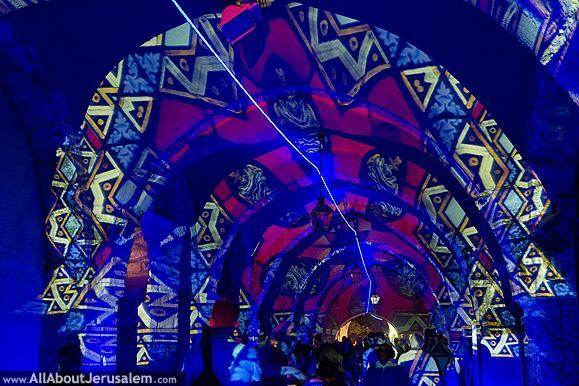 “This is the fourth year of the light festival in Jerusalem, revealing every year its beauty and magical sites. Jerusalem is a massive mosaic of people and communities, views and sites, smells and tastes that can all be found in the Old City. Millions visit it every year: tourists from abroad, visitors from all over Israel, and of course residents of Jerusalem. With that, the festival allows us to witness the sites of the Old City with advanced technological means, showing us the city in a new light. The festival manages to surprise us every year, hosting local and international artists that present to us their professional and fantastic work”. Experience it here and here.